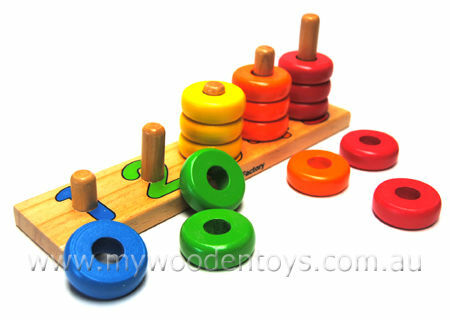 Wooden Counting Stacking Rings is a classic educational number, colour, sorting toy. Fifteen coloured rings fit over different sized uprights which are numbered one to five. The coloured rings are also in number sets 1 blue, 2 green etc so you have to sort the colours onto the correct upright. This toy can be used in many different ways and gives many opportunities to explore numbers and sets. Great fun and educational as well. Size: Base is 27cm long 6cm wide and 1.5cm thick. Tallest peg is 9.5cm tall. Material: Wood with Child safe paint and varnish. We like this because: "Very well finished nice and strong. Ideal for school or kindergarten environment"